As this year’s event demonstrated, CES is as much about marketing as it is about tech; it’s chock-full of innovative ideas and brand experiences. 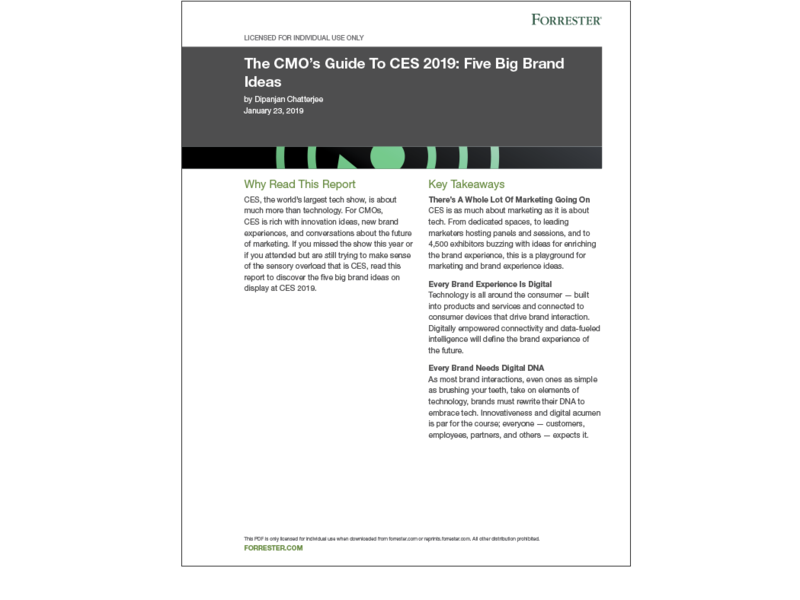 Few CMOs will remain unimpacted by technology. And as technology is continuously built into products and services always at consumers’ fingertips, a firm’s tech-forward DNA is becoming a brand imperative – critical to not only acquiring and retaining customers, but also to partners and talent. How will technology power the brand of the future? Read more to understand the five common themes coming out of CES this year. For additional insight from Forrester analysts and leading brands on the future of marketing, register today for Consumer Marketing 2019 in New York on April 2-3.